The term ectopic refers to something that is wrongly placed. When we talk of an ectopic pregnancy, we are pretty much defining a pregnancy that is in the wrong place, and in this case the pregnancy would be outside the womb or uterus. Over 95% of all ectopic pregnancies occur due to implantation within the fallopian tubes, hence the frequent use of the alternate name, tubal pregnancies.If left treated, the tube could easily rupture and bring about internal bleeding leading to fatal consequences. Because the pregnancy cannot be moved and placed on the uterus, ectopic pregnancies do not survive. Treatment involves removal of the pregnancy tissues and the fallopian tube affected. Mild to severe pain on one side of your pelvis and this pain may appear suddenly or gradually. 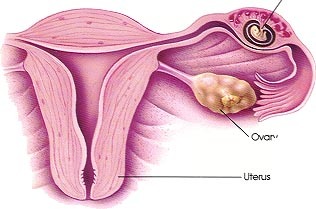 Vaginal bleeding which is different from normal menstruation. The blood may appear brighter and lighter or darker than usual and watery. The bleeding has been likened to the appearance of prune juice. The major contributing factor to an ectopic pregnancy is the damage of the woman’s fallopian tube. Damaged tubes make it difficult for the fertilized egg to freely make its way through the fallopian tube to the womb. Due to the obstruction, the egg will begin to develop in the tube. Pelvic inflammatory disease (PID).This leads to scar tissue formation in the fallopian tubes and could be as a result of gonorrhea or Chlamydia infections. A previous fallopian tube operation. Surgical procedures within the fallopian tube may cause scarring leading to a blocked tube. Fallopian tube procedures include tubal ligation as well as surgical procedures conducted to remove scar tissue or open up blocked tubes. Smoking. It is believed that smoking can cause damage within the fallopian tubes. Women smokers and even those who quit are at a higher likelihood of developing an ectopic pregnancy. Getting pregnant after tubal ligation or when you have an intrauterine device or IUD is quite rare. Pregnancies that develop in these circumstances are more likely to be ectopic. Some causes of this abnormal pregnancy are still unknown. If you experience the classic symptoms of an ectopic pregnancy, you need to seek immediate medical attention. In most cases, these pregnancies are arrested early enough to conduct tests and perform surgical operations if needed. If the fallopian tubes are ruptured, the doctor will take the patient straight to surgery. Proper diagnosis first needs to be done before treatment. The doctor will first have to take a pregnancy test which will confirm pregnancy and measure the hCG levels in your blood. Low hCG levels are an indication of an ectopic pregnancy. Blood tests also may be undertaken to identify pregnancy hormone levels. An ultrasound scan is necessary in confirming and locating the position of the pregnancy. Ultrasounds don’t always produce conclusive results and you might need to undergo another scan after a few days. If the ultrasound still doesn’t confirm the pregnancy, an investigative operation can be done using the laparoscopy procedure. This is a minimally invasive procedure that is conducted via a tiny incision using a viewing instrument. The doctor could opt to begin treatment by decreasing the cell growth in the pregnancy using methotrexate (Maxtrex). This shrinks the pregnancy tissue and diminishes it completely. The major advantage with this course of treatment is that the patient will not have to undergo surgery. However, the success rates are lower and in some cases surgery is necessary after this treatment. Surgery may be done using a minimally invasive procedure or open surgery. Usually, a laparoscopy is conducted during diagnosis and when confirmed, the pregnancy will be removed at the same time or at a later date. In some cases, open surgery is necessary especially if problems result from the laparoscopy or when there is internal bleeding, which is hard to control within the abdominal cavity. The pregnancy can be managed using a “wait and see” technique. Doctors take to this management system when an ectopic pregnancy is suspected without symptoms. No treatment is administered using expectant management and some pregnancies will naturally miscarry when there are low pregnancy hormones and no egg sac evidence. Expectant management could be followed by the general or surgical treatments mentioned above. If you have an ectopic pregnancy, your doctor will recommend the appropriate treatment for your pregnancy. Support is also provided throughout the treatment period and after treatment.